“Fans of The Mortal Instruments [by Cassandra Clare] will love this!" After escaping from the Hollows and the Michaelea lightwarriors, Jordan takes Alyx and Israel to Aradale, a secret Rogue community, where they appear to be safe − for now. But did they bring the enemy with them? “Mini”, the strange and speechless young girl they rescued from the Hollows, is not as she seems. Why was Elder Michael keeping her locked up? What is she hiding? Alyx and Israel are driven further apart as Israel continues to obsess over making Adere human and Alyx hides two secrets from him: that he may be part-demon and that she may be carrying his child, a tri-blood keye that can be used to unlock Hell. Out in the mortal cities, pieces of Black Stone, the only material that can disrupt the angels’ healing abilities, continue to be stolen to make weapons for Samyara’s dark army. Alyx and her friends must stop them, but this means infiltrating holy and guarded places to steal the Black Stone − a monastery in remote China, a mosque in Saudi Arabia, an art gallery in Florence and a cathedral in Peru. Jordan’s face broke out into a grin. Israel didn’t have a good feeling about this. Jordan pursed his lips and stepped up to Israel. This Rogue was a few inches shorter than Israel, but he had this thing about him that made him seem bigger, taller, than he actually was. Israel lifted his chin higher. “Which is?” Israel repeated. He wasn’t intimidated by this Rogue, magics or not. “I write about fantastical things, especially creatures with fangs, magic or wings. I want to tell you tales that will rip away the glamor from your life, keep you running and fighting and gasping long past the devil’s hour and maybe, just maybe, reality will look a little bit different when you return. At the beginning of 2013, Hanna left her "respectable" career, packed up her life and sold everything except for what fit in a suitcase to be a full-time writer and go "gypsying" across Europe. Even she thinks that she is a little crazy sometimes. Hanna Peach is the author of Angelfire, book 1 of the Dark Angel series. 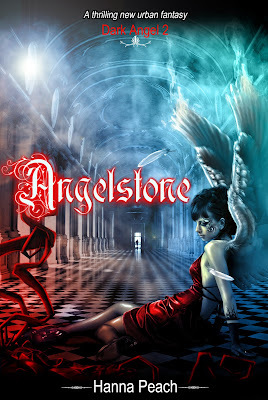 Angelstone, (Dark Angel #2) is due for publication on 31 May 2013 and Angelsong (Dark Angel #3) is due late 2013. Get Angelfire for FREE here! Check out Angelstone on these sites! OO thanks for the heads up on this one. I just snagged it on Amazon. Yay!! I love TMI so looking forward to this! I really do love the covers on this series. I grabbed Angelfire the other day and will grab this one tomorrow. It sounds like a fantastic series. Thanks for sharing. Instagram Photo A Day Challenges!